Compaq Fibre Channel 234458-001 transceiver kopen? | That's IT! Nieuwe Fibre Channel 1000Base-SX 850 nm GBIC van IBM of Compaq (zijn volledig identiek). 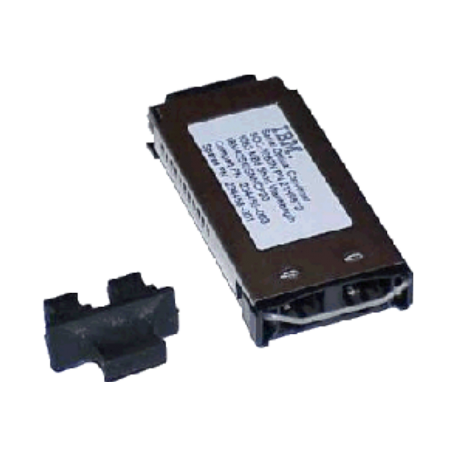 Fibre Channel Optical shortwave GBIC Made by Vixel 1Gbps SC connector, Multimode. For use in switches, hubs, hba's, RAID subsystems and other Fibre Channel components. This is an exact replacement for Finisar FTR-8520-5, Compaq 234456-003 and 234458-001, IBM SOC-1063N, 21H9775, 21H9870 and 21H9872, Vixel OE1063SW, Molex 86990-9064. It works in Brocade 2xxx switches, Vixel and Emulex 1Gbps FC HUBs, Qlogic/EMC switches, various 1Gbps FC HBA's and many 1Gbps storage enclosures and SAN routers.